It’s the seventh day of Christmas and we know what that means: New Year’s Eve is here. It is time for the countdowns, late-night parties, those last minute donations for tax purposes, and, of course, self-improvement resolutions. And, as a shout-out to Oregon Duck fans: today marks the beginning of the countdown for some big football game (or is it a flower show? What is the Rose Bowl, anyway?). At this point in the Christmas Season I want nothing more than to sing a new song. One thing I find a bit tiresome about this time of year is the ceaseless Holiday music that plays in every crowded store, airport, and, of course, Starbucks. It is not that I am a Scrooge when it comes to Christmas music. I love most Christmas hymns. But being subjected to forty-seven different versions of “Winter Wonderland,” “The Christmas Song (Chestnuts Roasting on an Open Fire),” and, the worst of the worst, “Baby It’s Cold Outside” from the day after Thanksgiving until Christmas Day really irritates me. Because my musically-trained brain soaks up music like a sponge, I cannot ignore “background” music. Therefore, these upbeat, catchy Holiday melodies and lyrics get stuck in my head very easily. As we all know, when a song worms its way into the human brain, it is very challenging to hear anything else. And Holiday music—everything from the classic hymns to the annoying Target jingles—seems to be composed precisely for this purpose. How can we hope to sing a new song with the old songs buzzing around in our heads? The same seems to be true for old habits we set to break at this time of the year. We want to change, but those old and sometimes harmful ways of being are stuck in our heads, hearts, and bodies. But this year, I’ve heard the old songs in new ways, thanks to my young nephew and nieces. At 5, 3, and 1, they are at the perfect “Christmas” ages. Everything is new and exciting: the trees, the star, the gifts, the nativity story, and even the most traditional of the Christmas songs. It is so much fun teaching them the old familiar songs and hearing them sing them back. (Humorous Greiner family side note: I overheard my nephew singing O Come All Ye Faithful to himself the other day. In his version the words are O Come Oh Mommy Faithful. What a testament to my ever-faithful sister!) The newness of each Christmas tradition brings out that spiritual gift of wonder and awe. Newness and wonder, especially at such a young age, tend to go hand in hand. But as we get older, the familiar can all too easily become rote. We cannot perceive the new when we don’t allow the Spirit of Wonder to move us to see, hear, touch, smell, and taste in new ways, that is, with appreciation for all the miracles around us. It takes the eyes and ears of children to reignite this deeply human wonder and awe. I think our fascination with the New Year and its promises of fresh starts and new beginnings is rooted in our deep spiritual hunger for this child-like wonder and awe. We want to sing new songs, songs that help us widen our perspectives and allow us to be more creative, grateful, and open to the movement of the spirit, but at the same time, we do not want to lose the comforts of the old songs or our old ways. The all-too-familiar Psalm 96 calls us to sing a new song of praise and wonder. But how do we start to sing new songs when the old, familiar melodies feel so much more comfortable? How do we let the Holy Spirit break in and do something new when we constantly maintain the status quo? How can we hope to change while carrying on our old routines? How can I let go of my need for fixed answers in favor of aliveness? What is my next challenge in daring to be human? How can I open myself to the beauty of nature and human nature? Who or what do I need to learn to love next? And next? And next? What is the new creation that wants to be born in and through me? For me, that last question gets at the heart of the spiritual gift of wonder that the Christmas season instills and I am hopeful that sitting with this question will help me hear a new song. 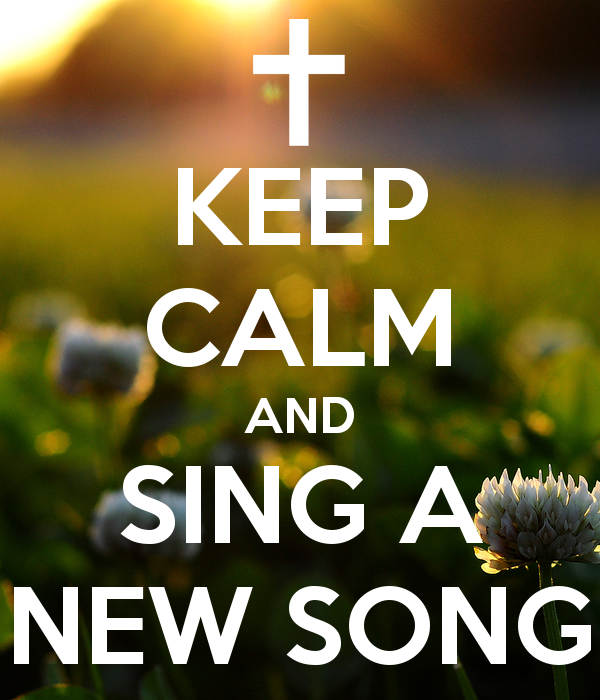 I don’t know what this new song of 2015 will be, but I am confident that our loving, compassionate God will place a new song within me and within all of us, if we have the courage to first listen and then sing it out. For our God is ever ancient, ever new, compassionately and playfully sustaining and creating every aspect of the universe. Take heart on this New Year’s Eve, this Seventh day of Christmas, that God is doing something new and then pray that we may all perceive and participate in whatever this new creation may be.